pagnapagna: Kilat-Amontoc route Part 2/3 - What is it with "BATONG BURLAS"? Kilat-Amontoc route Part 2/3 - What is it with "BATONG BURLAS"? "This is my second part of my 3 post on my Kilat-Amontoc route going to Tangadan Falls but after Kilat falls, just curious about what it is, I went to look at the so-called 'Batong Burlas'." After visiting the Kilat waterfalls, I went back to Kilat proper and walked eastward on a one-lane road that eventually turned into a rough road. This road is still just above and along the river. Passed by a residential area of some few houses then at the right side, just below the slope of the mountain is a ricefield with tilapia fish pens. I met one of the farmer to whom I asked where can I find the "Batong Burlas". "Agpakasta ka lang dita baba" (just go down there), he answered pointing to a short trail going down to the river. At the end of the trail was the rock-ridden river bank. There it was a very large boulder and fronting it was the river rapids. 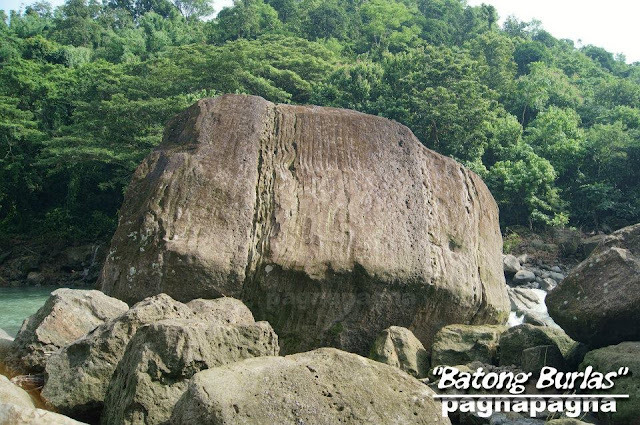 It is as large as a house and it is the "Batong Burlas". It is unique in the sense that it is the largest among the other rocks and boulders. 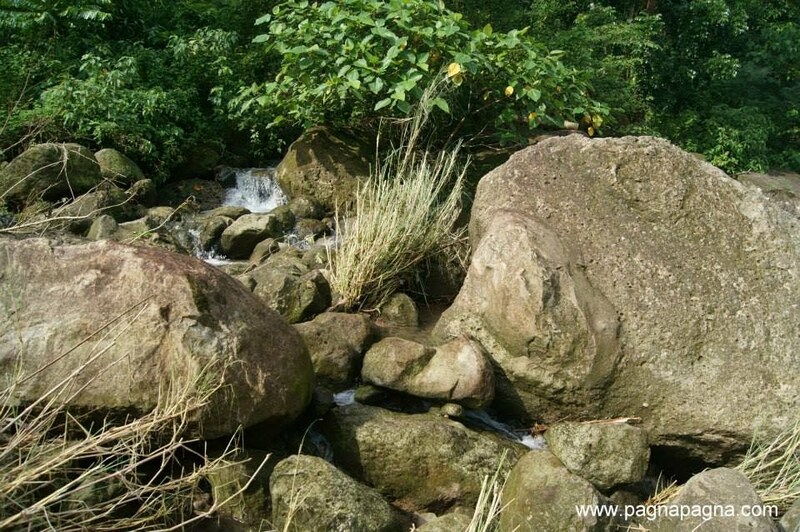 A small water coming from the mountain makes it way through the rocky river banks and into the bottom of the large boulder before it joins with the river. goes down to the "Batong Burlas" and into the river. From what I've known before, this is one of the favorite swimming area of locals and from neighboring towns such as Bacnotan during the hot summer days of summers. I asked some two people in the area about the significance of the large boulder that they regarded as "Batong Burlas" but I get sketchy answers. I should ask the elders and that is what i will do when I go back to the area again. I went back to the Kilat residential area (where Belen store is located) and from there I started walking on the uphill road going to Barangay Amontoc that will lead eventually to Tangadan falls. "A free standing solid rock found in Sitio Kilat, standing around 3 storeys high.. local folks says you can find a footprint of the mythical giant Angalo on its summit"
© All original content copyright sparkPLUG, 2012-2015.Please ask permission for content use.